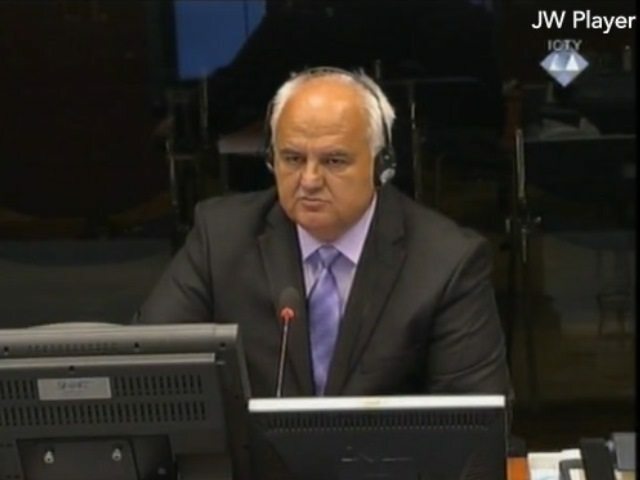 While cross-examining Defence’s military expert Dragomir Keserovic at Radovan Karadzic’s trial at The Hague, prosecutors try to prove that Serb authorities and forces committed persecution of Muslims and Croats from Bosanska Krajina in 1992. Not denying that forcible resettlement, detention and other crimes happened, Keserovic, the then Officer with the First Krajina Corps of the Republika Srpska Army, VRS, said that those were acts by individuals, not the policy of authorities and VRS. Karadzic, the then President of Republika Srpska, is charged with persecuting the Muslim and Croat population from 20 municipalities throughout Bosnia and Herzegovina. According to the charges, the persecution reached the scale of genocide in seven municipalities. Prosecutor Jullian Nicholls presented a series of documents issued by officials of the Crisis Committee in Sanski Most referring to “the deportation of each person, along with members of his family, offering resistance to Serb authorities”, “deportation from these territories for good” and “taking civilians for an exchange”. Keserovic responded by saying that those notes referred to “deportation of extremists” and “non-loyal” Muslims, who “possessed arms”. “The fact is that the policy of the authorities and Army was not to deport the civilian population, but rather to protect it,” the witness said. He mentioned that Muslim civilians were exchanged for Serb civilians who wanted to leave the territories controlled by Muslims. Recalling on documents about “2,000 captured civilians”, the Prosecutor said that the First Krajina Corps of VRS sent Muslim politicians and “unwelcome persons” from municipalities in the Krajina region to a detention camp in Manjaca. “It is true that civilians too were sometimes present in detention centres,” the witness confirmed. When Prosecutor Nicholls presented him with a document, indicating that 24 detainees from Sanski Most were already dead when they arrived in Manjaca, Keserovic said that they suffocated to death in trucks due to a lack of oxygen and high temperatures. He also confirmed that the conditions in the detention camp were difficult, that there was not enough food and water and that detainees were beaten up, “but it was not the rule and it was not allowed”. Responding to a Prosecutor’s allegation that, in September 1992 the VRS put pressure on Muslims from Kljuc to leave the place, among other things, by setting their houses on fire, the Defence’s military expert said that it was not true. While accepting that crimes were undoubtedly committed, Keserovic interpreted them as a reaction to numerous attacks by Muslim and Croat forces on the Army and police. Suggesting that the VRS shot about 150 Muslim prisoners in Cerska village during its military operation in Srebrenica on July 17, 1995, Prosecutor Nicholls asked Keserovic whether the operation commander would be considered responsible for that crime. “Yes, the commander would be responsible, just like the perpetrators,” the witness said. The trial of Karadzic is due to continue on Monday, July 29.